Successfully Added 2000 Lumen LED Projector - 1500:1 Contrast Ratio, 50 to 140 Inch Projection, 1080P Support, Keystone Correction, HDMI, VGA, USB to your Shopping Cart. Enhance your multimedia experience with this 2000 lumen projector - ideal for gaming or budding home theater enthusiasts looking for affordable big screen entertainment without breaking the bank. This compact projector uses a 5 inch LCD display and LED lighting to offer up 2000 lumens and is capable of projecting images up to 140 inches. A native resolution of 800x480 brings clear viewing while the 1080P support and wide range of input modes ensures you can use it with most consoles, PCs, DVD and Blu-ray players. Available at the fraction of the price a flat screen 42 inch TV would cost this projector offers viewing that is 3 times bigger and with a projection distance of 1.2 to 4 meters is suitable for home theater use. A 1500:1 contrast ratio ensures a good color range and thanks to LED technology the lamp in this projector has a 50,000 hours life expectancy. 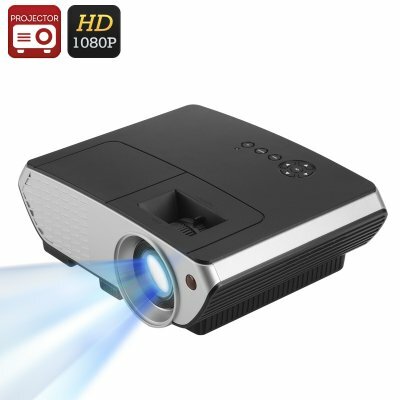 Great for movies or presentations the projector supports 4:3 and 16:9 aspect ratios while the manual keystone correction and 1.5 zoom lets you obtain a clear picture without any distortions. Mount this 2000 lumen projector on you ceiling or rest on a desktop and you can take your household to the moves without leaving the living room, all thanks to this affordable home projector. This 2000 Lumen projector comes with a 12 months warranty, brought to you by the leader in electronic devices as well as wholesale projectors and home theater gadgets..